Today, along with more than 200 other food bloggers, I am devoting my post to the issue of food hunger in the USA. I do this not just because as a restaurant reviewer I am literally paid to eat, but for a reason that up until now I have shared with almost no one. As a child, my parents struggled to put food on the table for me and my six siblings. A typical breakfast when I was five consisted of Saltine crackers smeared, barely, with butter, and coffee cut with evaporated milk because fresh milk was too costly. My siblings and I still joke about the ketchup sandwiches we had for lunch. We ate pasta at minimum three nights a week, often four, and often with only olive oil and garlic. The recipe at the end of this post pays homage to this. – Food stamp recipients are allowed $4 a day. (What did you pay for your coffee on the way to work this morning?) And Congress is looking to cut back on food assistance programs! To get some idea of the seriousness of the situation, check out this trailer for the film documentary ‘A Place at the Table.’ (It’s short and includes music by Mumford & Sons.) 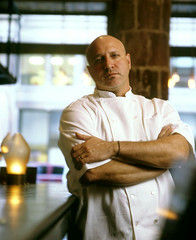 The film features Tom Colicchio, among other celebrities. If Tom thinks this is an important issue, don’t you? A Place at the Table is showing in limited theaters, but you can view it on demand through iTunes and Amazon. Private sector programs and charities are not enough; policy change is required. Join Share Our Strength’s effort and send a letter to Congress today demanding action. I have. Why this recipe today? Well, my daughters – even the picky eater – happily ate it as children; it’s quick, cheap, easy to make, and utilizes inexpensive pantry staples; it’s delicious and reminds me of my Italian-American heritage. In a large skillet or wide-bottom pot saute garlic in olive oil over medium heat until garlic just begins to color, 1 to 2 minutes. Add tomatoes, oregano, and pepper and bring mixture to a boil. Reduce heat and simmer (still bubbling), for 5 minutes, or until tomatoes have lost their metallic taste. Add beans and simmer, covered, for about 20 minutes, stirring occasionally. Meantime, cook pasta. Drain and add to bean mixture and simmer, tossing gently, for 1 minute. This entry was posted in Favorite Finds, Recipes and tagged A Place at the Table, food bloggers against hunger, Mumford & Sons, pasta with beans recipe, Share Our Strength, Tom Colicchio. Bookmark the permalink. Pat, I shared this on my Facebook page with the hope to extend your message. It was an eye-opener for me yesterday when I participated in the Foodshed Alliance’s Local Share Dinner. So many people who came to the “pay what you can” to have a good meal, prepared by quality chefs were those who clearly do not often have the opportunity to eat meals prepared with fresh meats and vegetables. Sadly, it is here in NJ, sadly it is predominate in the US, sadly Congress is looking to cut food stamps, and sadly there people who think drug testing should be done on people who need food stamps. They should volunteer at a soup kitchen or a dinner like yesterday and see this is a serious problem and that people who need food stamps are not just people who are on drugs. Diane: Thank you for sharing your experience and your thoughts. Sad, shocking, and all too true. Brava, for having the courage to bare your soul to bring attention to this issue. There is no excuse for hunger anywhere on this planet, here in the United States or abroad. Education is critical. So many foods that are low in cost are high in nutrition and flavor, but the general public is not aware of how to use them. The so-called “cucina povera” of the Italian immigrants is a tremendous resource for dishes that are rich in taste and easy on the budget. Thank you for sharing your recipe for pasta with beans. I think I’ll make some tonight! Glad to have you participate and share your story! I think there are a lot of us that don’t realize how it effects so many of our friends, neighbors or co-workers. Great, simple recipe that you shared! Thanks! I was honored to be part of the effort.